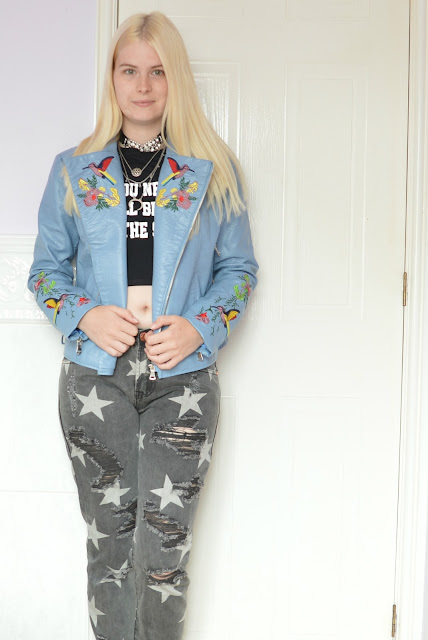 Today's outfit features a blue leather jacket from RoseGal, A 90's Crop Top from TheBeWordShirt, Star Jeans from Glamorous and two necklaces also from RoseGal. First up how amazing is this jacket from RoseGal. The embroidery details are lovely and really make the jacket stand out as well as it's pretty shade of blue. As soon as I saw it I knew I needed it. 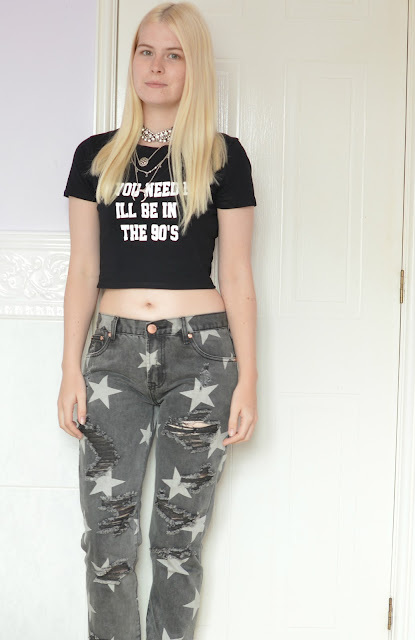 The crop top from TheBeWordShirt has this really fun quote on it which says "If you need me I'll be in the 90's" which is so true with this entire outfit. It's a really cute crop top which I think could be rocked with anything because of it's colour although I would generally wear crop tops with high waisted jeans or a cute high waisted skirt. These super cool jeans are from Glamorous. I had originally bought the blue pair but I bought them a size too small which meant they didn't fit and the next size up were no longer in stock so I ended up getting this grey version. They feature star shapes and are heavily ripped which is really on trend right now. The first necklace is this amazing choker from RoseGal. It's the sort of piece that would look good worn with a dress ready for a night out and is especially great for the upcoming party season. I'll definitely be rocking this often. The other necklace also from RoseGal is this three layered necklace which yes is one piece. This can be worn with anything and matches really well with most of the jewellery in my silver collection.